The red rusting steel stacks take on purple hues in the light of the sunset’s glow, hues like the colors of a bruise in the days after a bad fall. 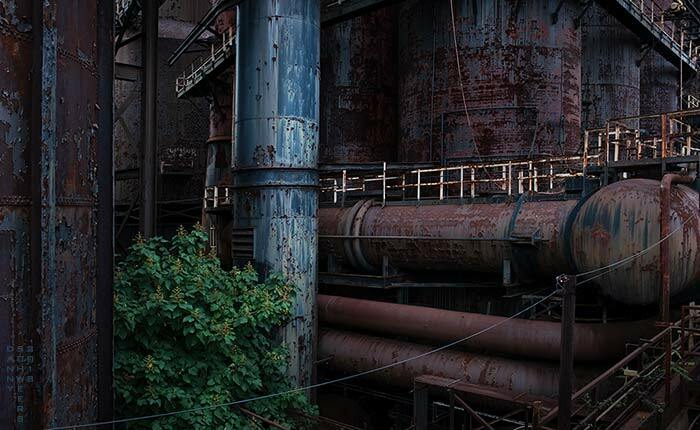 It is now 28 years since the last cast at Bethlehem Steel. People are still pointing fingers as if Americans in a fair fight cannot lose and cheaters must be blamed when we do. Look! Are we not alive? Is not every moment followed by another? Only God can hold them all while we must live them one by one. Look! Here comes another moment! Join me! Let’s explore it! Photo of the remains of Bethlehem Steel from the Hoover Mason Trestle, Bethlehem, Pennsylvania. Photo and text copyright 2018 by Danny N. Schweers. Great words, great photo, beautiful colors. Bethlehem and Allentown both seem to have bounced back from the steel mills' demise, with employment and income only marginally lower than the Pennsylvania average. Here is a link to an article by a former mayor whose words echo my prayer.